Cadis Etrama di Raizel wakes up from 820-years long sleep and starts a new life as a high school student. His peaceful days as a student are soon interrupted by a group of attackers known as the "Unions." Noblesse follows Raizel and his loyal servant, Frankenstein, as they constantly protect and save Raizel's new human friends from the mysterious threats. There are several words that come in mind when trying to describe this ONA, and the most suitable one would be that it is hilarious, even with the underlying, or rather, main theme of this work: vampires and Frakenstein. Yes, you read right, Frankenstein and his very master that awoke after his long slumber. It must be noted that is has its share of action as well. Noblesse: Awakening is an adaptation of the of the korean manhwa Noblesse. The story surrounding vampires is nothing new, yet the fact that it incorporates both Frankenstein and his master, Cadis Etrama di Raizel, is something I have yet to see in the medium itself. What is actually intriguing is the fact that the "master" awakens in modern society, so there are naturally futuristic things he quite doesn't understand, which creates some very amusing situations. It also includes a good amount of well executed action, which came as surprise. For the matter, it is only 30 minutes long, so it isn't able to represent the scope of Noblesse, and thus is quite condensed, yet this serves to transmit well paced action sequences. However, this also means that there are a lot of things introduced that aren't explained to the viewer, which was to be expected. As for the characters, there is not much say besides that the main protagonist, the master of Frakenstein, is silent, cunning and "badass" character, which is quite pleasing to see. The supporting cast are composed of zombies and vampires, which are necessary for the setting, yet their motives or why they're there is unknown. Concerning the animation of this ONA, it is very well done, fluid motions and great choreography in the battle scenes. In addition the backgrounds were satisfying enough, including the character's designs which can be a bit generic, yet is a slightly different from what audiences are used to see. I might want to add that Frakenstein and the master are represented as "bishonens" yet without its typical personality, which to some may be a great addition - what usually is depicted as a malformed, is now a bishonen. As for the soundtrack, it was average, yet befitting of the anime, including the opening and ending. All in all, I really enjoyed this ONA despite its generic premise and I am certainly now inclined to read the manhwa of this piece - or rather, seeing an adaptation of the series, as the premise can turn out to be something interesting. I would definitely recommend anyone to check this piece out, it is only 30 minutes long; and you never know, you may end up liking it. This is an adaptation for one of the best manhwa out there, Noblesse. Let me give u a head start if you want to watch this OVA. dont expect that it will cover up most of the manhwa since this is only a 30 minute adaptation and there'll be some fast pacing in the story but still for me I find it enjoyable to watch. forgive me if I only scored it 8 but the OVA has made me crave for more. the ending was not that bad. I JUST wished they made it longer lol. I also gave it an 8 since the OVA hasnt changed from the original storyline which was GREAT I say, since some of us knows that OVAs usually has another world of its own. WOW. Just WOW. The art was very very GOOD. They really put a great effort in doing this OVA. And All I can say is, Great Job IG Prod. Great Job. The art was beautifully drawn and characters was also given proper animation. Im really amaxed on how they've done this. The art on this one is a must see. There is no OST present. just some bgms which fits the story and every scenes. do i need to say more? EXCELLENT! I can kiss IG Productions for this. they've given judgement to the characters. even their voices!! Rai is so gorgeous so as Frankenstein. they really didnt stray to the original manhwa and still had given proper execution on every characters. Even the villains. Literally, I'm screaming every scenes. I enjoyed it so much and never expected that the OVA was really good. Every scene and characters are pinpoint and it made me jumped every time. If you are one of the fan of the series I say give this OVA a go. Its worth it. I recommend those who read the manhwa to also take time to watch this OVA. Its really worth the watch although it may leave you with lingering feelings and craving for more, it did to me. if you want the short version: Id say this is more enjoyable to people who are fans of and have read the manhwa than people new to the series, so if you havent read that already then you definitely should, but maybe hold of on watching this till then. I just wanted to make this review so that people dont get the wrong idea about this series, whilst i did very much enjoy this ova i think the pacing was ridiculous and kind of ruined would could of been an even better experience. Its been a couple of years since i read the section of the series that this ova covers but to put it in perspective this 30 minute ova tried to cover something close to 80 chapters of the manhwa, which to me seems like a bad idea on the behalf of the animation studio, but i do understand as not alot of action happened early on in the series and i guess they wanted to get to that because thats people want to see i guess. overall aside from the extremely bad pacing which ruined and took away from alot of the characters and the plot i enjoyed this and it was really great to finally see my absolute favourite manhwa being animated, although i feel like unless youre a fan of the manhwa prior to watching this it may seem awfully generic and lacking. so my recommendation would be to read the manhwa atleast the first 80-100 chapters before you watch this. Story i would personally give an 8 because i can understand and i know alot of stuff that wasnt shown, but if i hadnt already read the series the story would probably be closer to a 6 tbh. The voice actors were all fairly good choices aside from maybe rai and m21 who both seemed to sound alot younger than they should of. anyway overall id give it an 8, but i can understand if alot of people really didnt think much of this. I think that anime adaptions of manhwa and manhua are greatly encouraged due to a lot of them having really great stories to tell. One of these is noblesse which is a brilliant manhwa that uses something as generic as vampires and creates something extraordinary with these vampires. However, Noblesse Awakening while being an enjoyable watch, it does not capture the integrity of the source material. Of course I can't be too harsh, this ONA is only 30 minutes or so and its hard to pack the first 80 chapters of a manga into 30 minutes. Obviously I knew they were going cut out much detail in an attempt to cram as much info into these 30 minutes as possible. Well let's start with the positives, one, the animation is pretty gorgeous. It was colorful and fairly fluent and I really loved the character designs. There were a couple of moments where j didn't care for the animation such as when Frankenstein was bowing down to Rai. The voice actors and music were also quite good and they both fit into the story. The action and comedy were also on point and they captured the essence of the series. The story was the most dissapointing part of the ONA. This was because they extracted an excessive amount of detail from the source material. All they really gave us is the framework of a great story. The same happened with the characters. They made it so blatant that they were skipping around that characters just appeared out of nowhere contrary to being properly introduced. Well in the end there isn't much to say. 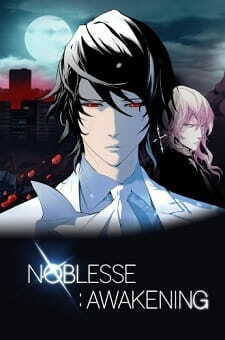 This ONA is good for people looking to get into noblesse and it was quite nice. However the way I see it you should only watch this if you've red a significant amount of noblesse because in the end all this is is an overblown commercial for the amazing manhwa. Driven with their thirst for blood, there's no denying that the vampires are one of the scariest creatures of the night. However, in the world of anime, these vampires are no longer feared but adored by many for their royal and eternal beauty. Let's check out the 10 hottest vampires in anime! You might have a different preference, but we think that the black haired boys of anime exude a certain mystique that the brunettes and blondes just can't keep up with! Let's explore these dark fields with a collection of 20 of the hottest black haired boys in anime!